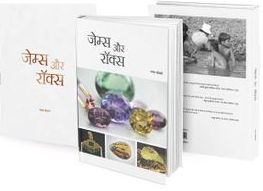 At a gem lab one always expects some unusual and interesting gem materials coming in for identification, especially if that lab is located at one of the major centres of coloured gemstones, like the Gem Testing Laboratory, Jaipur. Seldom does one find an interesting mineral specimen hiding on the shelf. Recently, during an on-site testing assignment, the author was taken by surprise when he was setting up the equipment. While opening a fresh bottle of RI Contact Fluid, a solid object was seen attached to the brush end of the fluid applicator. Initially it was thought to be impurities deposited on the brush. Therefore, the applicator was taken out very gently so that the attached material could be removed without contaminating the fluid. The author was surprised when the attached solid material was revealed as a cluster of large, bright yellow, bi-pyramidal crystals (figure 1). These were immediately assumed to be sulphur. However, the author had not previously encountered such large crystals in a bottle of RI Contact Fluid, although fine grains are quite common. The largest crystal measured approximately 14.70 mm in length. The crystal was carefully detached from the applicator and was kept safely for further study. 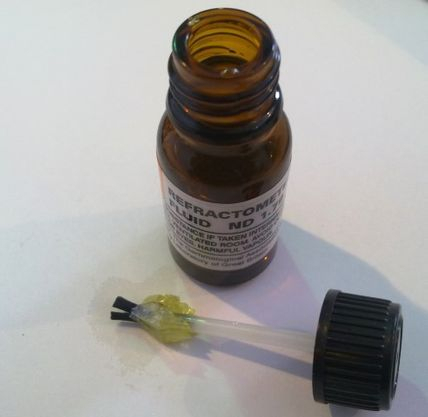 The lab had purchased several bottles of RI Contact Fluid bottles from the Gem-A shop in London in August 2009 and when checked back at the laboratory another was also found to contain similar large crystals. One was of good quality (figure 2) and also extracted for study. 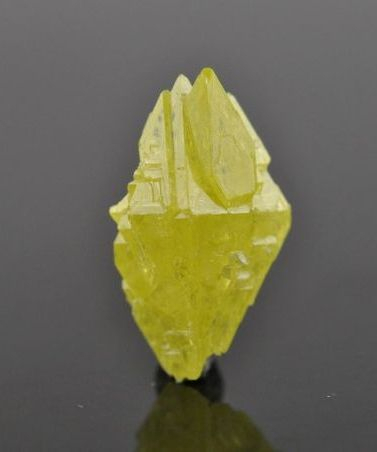 Figure 1: Large bright yellow, semi transparent to translucent bi-pyramidal crystals (of sulphur) formed at the lower end of the applicator of the RI Contact Fluid, procured in August 2009. Figure 2: Such crystals with high degree of transparency were also produced in another bottle of the contact fluid procured in the same batch. 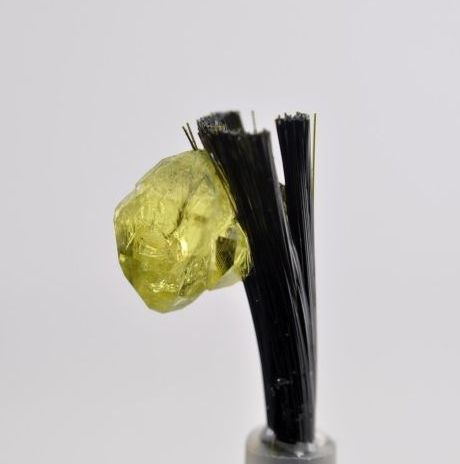 The two largest crystals weighed 1.62 and 1.09 carats and measured 14.70 and 9.24 mm, respectively in their longest direction (figure 3). 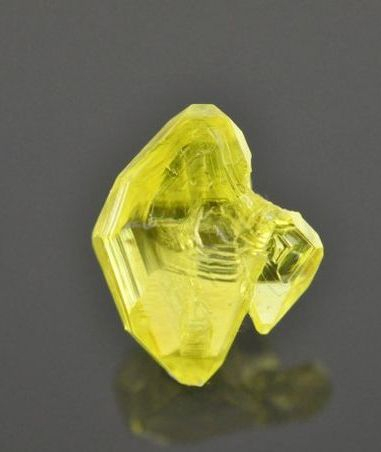 Both were bright yellow with a bright vitreous lustre, but variable degree of diaphaneity; the 1.09 ct specimen was transparent while the 1.62 ct specimen was translucent. 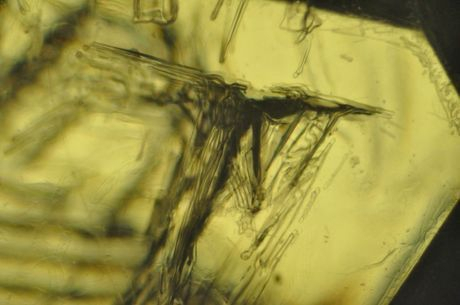 Both crystals displayed a characteristic bi-pyramidal habit associated with the orthorhombic system and sharp crystal edges; the 1.62 ct crystal displayed a high degree of twinning, with smaller crystals extending out of the main crystal from the pyramidal faces (see again, figure 3, left). The 1.09 ct crystal was also twinned, but the smaller daughter crystal was attached to the main crystal at one of the corners along the horizontal axis; in addition, this crystal also displayed distinct and sharp striations following its edges (see again, figure 3, right). Figure 3 : The two largest sulphur crystals extracted from the cluster displayed bi-pyramidal habit associated with orthorhombic crystal system, measured 14.70 mm (left) and 9.24 mm (right). Note the difference in transparencies of the two crystals. Also note the striations following the crystal edges (right). For curiosity, the crystals were observed under the microscope. Although the 1.62 ct crystal did not display any characteristic features, the 1.09 ct crystal did. A group of long and short tube like features was present, where the tubes appeared to be oriented in three directions following the edges of the pyramidal crystal face (figure 4). In addition to these tubes, a large negative crystal was also present; this negative crystal also contained numerous smaller globules and little tubes (figure 5). In addition, some wavy colour and growth zoning was also present, oriented mainly along the planes perpendicular to the 'c' axis (see again, figure 5). 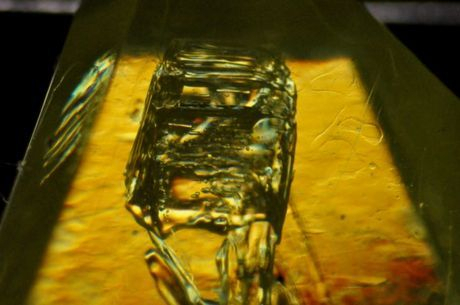 Strong doubling of inclusions (again, figure 4) and crystal edges was also obvious, as expected for sulphur, which has a high birefringence of 0.291. Figure 4: A group of long and short tube like features was present in the crystal illustrated in figure 3, right. Note the orientation of tubes in three directions following the edges of the major pyramidal crystal face. Also note the doubling of inclusions caused due to high birefringence of 0.291. Figure 5: Large negative crystal was also present in the crystal represented in figure 3, right, which also contained numerous smaller globules and small tubes. Also present is the wavy colour and growth zoning oriented along the planes perpendicular to the 'c' axis. Tests were mainly conducted on the 1.09 ct sample because of its better degree of transparency. Hydrostatic SG was measured at 2.04, while under UV light (both long-wave and short-wave) the sample displayed a weak orange glow. 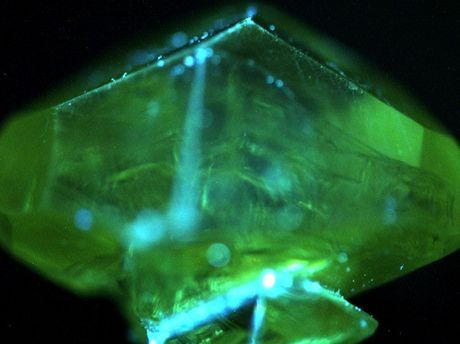 However, in DiamondView the crystal appeared green (figure 6). No observable pleochroism was seen. With a desk model spectroscope, complete absorption of wavelengths in the violet - blue region was observed; this was further confirmed by UV-Vis-NIR spectrometry. Raman spectra collected in the range 200-2000 cm-1 using 532nm green laser displayed sharp peaks at 218, 246, 437 and 472 cm-1 (figure 7), peaks consistent with elemental sulphur. As expected, the crystals were confirmed as being elemental sulphur, one of the components of the RI Contact Fluid along with tetra-iodoethylene and di-iodomethane (Webster, 1994). Although, sulphur forming as a result of sublimation from volcanic gases and/ or due to bacterial actions is quite common in nature, formation of a crystal of significant size in a closed bottle of contact fluid seems unusual and well worth a few minutes of a gemmologist’s time. Now of course, an important gemmological question! Should these crystals be described as 'natural' or ‘synthetic’?